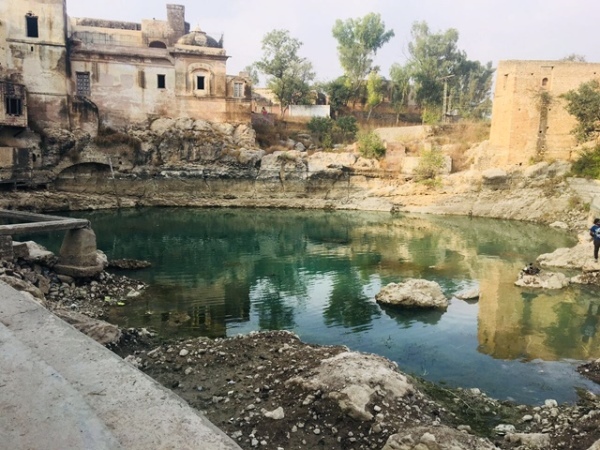 When the blue-green waters of the Katas Raj Hindu temple complex began to dry out last year, there was a furore in the media. Concern over the historical site brought the country’s attention (and the Supreme Court’s focus) to the plight of the local community’s dwindling groundwater resources. 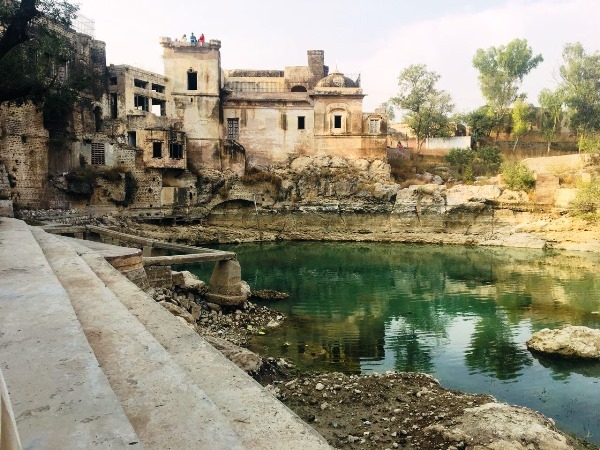 One of the most photographed sites in Pakistan, the Katas Raj Hindu temple’s pond is said to have been created from the teardrops of Shiva as he wandered the earth, inconsolable after the death of his wife Sati. For hundreds of years, Hindu pilgrims have bathed in this pond, whose plentiful waters also provided for the local villagers. In the winter of 2017, when we, a group of journalists, visited the area, the pond was almost dry. We learnt that not just the pond, but the entire area’s springs had dried out. The villagers told us the severe water shortages began once the cement plants started operating in their area. Near Kallar Kahar on the motorway, one can see from afar two cement plants belching emissions into the air. These were built back in 2004, despite protests from the local communities. There are currently three cement factories in this area, and another one in Kallar Kahar town. “Kahoon Valley faces environmental death” were the headlines back then, as the media actively covered the protestors. Unfortunately, they were not able to stop these factories, owned by two of the richest businessmen of the country, from getting the relevant permissions to go ahead with their plants. The Katas Raj pond has dried once before, in 2012. At the time, the local administration took action against the cement plants that are located around four kilometres away from the temples, by shutting down two of the plants’ water bores and diverting the water to the pond. But this was just a temporary solution. The local villagers squarely blame the cement plants for depleting the underground water in their area since 2008. The villagers now have to resort to boring down to 300-400 feet for water. They also say their children and elderly are suffering from asthma and other respiratory illnesses. 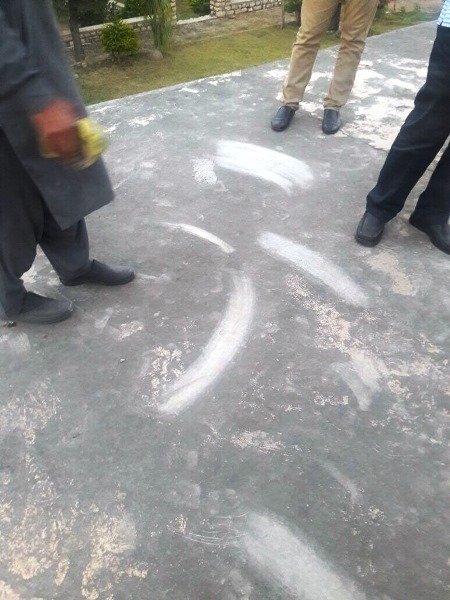 On the rooftop of one of the local houses, they brushed back the black dust to reveal the white concrete underneath. The dust from the factories, they told us, settles on their homes and fields, affecting their olive crops. The officials from a nearby plant told us a different story. That it is the local villagers themselves who are sucking out all the water from the aquifers by installing water bores in their homes, since there is no proper water supply to this valley. They told us their cement plants are using the latest technology to manufacture cement, and that their emissions are well within acceptable levels. However, the fact remains this is a crisis that has been in the making for over a decade. Kahoon Valley is a Barani (rain-fed) area, so the underground aquifers only get charged when it rains. 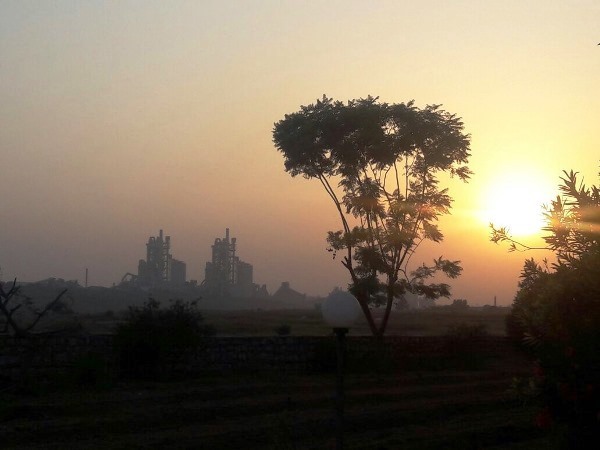 Raja Waseem, a local activist who has been campaigning against the cement plants since 2004, told us he had warned back then that the villagers’ groundwater would get depleted if they went ahead with the cement plants. “The Punjab government recently hired foreign consultants who have calculated that they are consuming 250 cubic metres of water per hour per one cement plant, while earlier they had said we would only use 10-15 cubic metres of water per hour,” explained Waseem. He had tried reaching out to the environmental departments and the courts at the time, but to no avail. 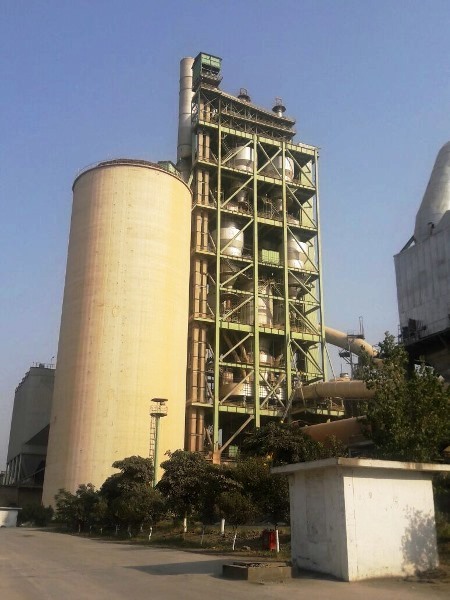 The two cement plants went ahead, excavating land right next to the villagers’ homes, without a proper Environment Impact Assessment (EIA) or a No-Objection Certificate (NOC) issued by the relevant environment department. Later, one of the plants set up another factory and expanded production after acquiring more land from the Punjab government. The government eventually conducted EIAs with no mention of alternatives (the nearby Lilla was a good alternative site) or the prevalent hydro-geological conditions in the valley. Finally, a public hearing was held, where the government was categorically told that there was wrong and missing information in the EIAs, but the government secretary issued the NOCs to the cement plants regardless. Clearly, the cement plants wanted easy access to the motorway, as raw materials for cement are readily available here. Former President Pervez Musharraf was told this land was barren and unfit for agriculture, in the final report sent to him for approval. The British Gazetteer of 1894, however, describes this area as the most fertile land in upper Punjab. With climate change expected to move production of many crops northwards, this cooler area should be preserved as our future breadbasket. 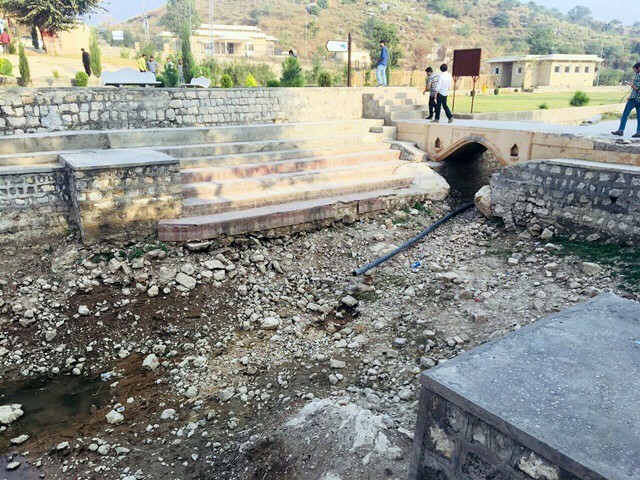 In December 2017, the Chief Justice of Pakistan (CJP) took suo motu notice of the Katas Raj temple’s dried out pond. 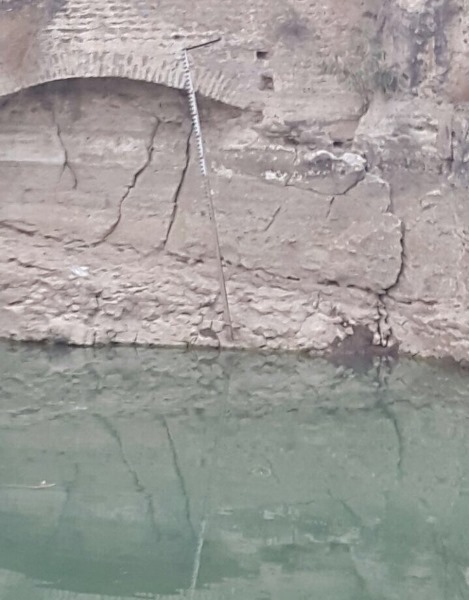 A three-member bench headed by CJP Saqib Nisar conducted an inquiry, and on May 8th this year, they directed the cement factories to put forward a proposal to find an alternative water source and pay for the water they use until then. The cement factories proposed they would submit Rs2 billion collectively as bank security, until they were able to find an alternative source of water. They said they would build a small dam in the area, and also proposed to pay the Punjab government for the water they would use until then. 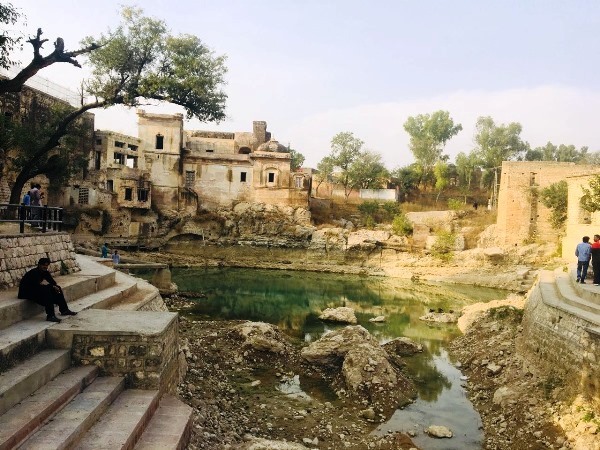 The CJP also noted that the cement factories would have to improve their systems of smoke exhaust, keeping in view global standards, and ensure that the pond in the Katas Raj temple would be filled. So is this a kind of victory for the local community; the aggrieved party fighting to save their livelihoods in their ancestral land? They told us that without adequate water and pastures for their livestock, they would have to move out of Kahoon Valley. “No, this is not a victory. In fact, it is just one big drama,” said Waseem, who is going to file an appeal on this latest Supreme Court order. He believes the cement plants have just bought themselves time (six months) to keep pumping out huge quantities of water, and are hoping that eventually the CJP will retire and then they can go back to business as usual. The Punjab government has recently decided that no new cement factory will be allowed in this area. The new policy to regulate the cement industry was finalised after a technical report was prepared by foreign consultants. However, Waseem says their fight is not over. Article par excellence. Great investigative journalism. 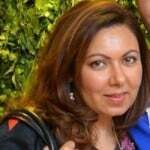 to environmentalists, and to her profession.